Floating shelves from the Acanto bathroom series ... also a stand-alone solution. Geberit, a European leader in the field of sanitary solutions, has embarked upon an ambitious expansion in the GCC, a diverse region expecting robust growth over the next decade. The Switzerland-headquartered company posted double-digit growth – 16.8 per cent in 2017 – in the Middle East/Africa and while the region currently accounts for 2.4 per cent of its global business, the ambition is to maintain significant annual growth up to 2020 and beyond, Gabriel Nassar, Geberit’s new Dubai-based managing director of the GCC, Pakistan, Sri Lanka and Iran, tells Gulf Construction. 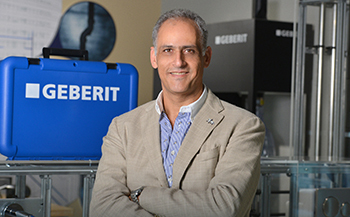 Nassar joined Geberit early this year to steer the company into a new era of growth and prosperity in the region. He is confident of achieving this target, given the Swiss company’s 125-year legacy of know-how and experience, reputed quality, its recent positioning as a company that can offer total solutions – not only for behind-the-wall systems (plumbing systems) but also in front (ceramics), following a key acquisition by Geberit three years ago. This is backed by efficient service that includes technical advice, design support, training of installers, timely service and swift spare parts availability. In addition, the regional market is growing – all of which will help the company attain its goal, he asserts. Nassar ... ample growth opportunities. Nassar, who has been in the region for the past 12 years, believes the GCC offers ample opportunities for growth given the number of projects coming on the market. “Geberit has always focused on Europe, its home market, but is increasingly looking at the overseas market which is growing, particularly in the Middle East, Africa and Asia,” he says. Saudi Arabia and the UAE are currently Geberit’s largest markets and focus areas in the region; the sanitary specialist is now looking at penetrating the Iranian market. Geberit has been in the Middle East for over 25 years. Its 500-sq-m regional operation based at the Dubai Design District includes its showroom, information centre, a small design office, specifications team, a sales and after-service team, and a training centre, where clients are taught how to adapt, install and maintain its products properly. The information centre – which opened at the end of last year – showcases all its competences from supply pipes, drainage pipes and all ranges of Geberit-branded bathroom ceramics. Geberit has a staff strength of 35 in the region of whom 30 are directly involved in serving customers in the region. The regional office is backed by a fully-automated logistics hub in Germany that ensures prompt delivery, with 85 per cent of the product requirements made available within 48 hours, Nassar says. “Around 95 per cent of the products supplied to the region originate from Geberit’s 26 factories in Europe,” Nassar says. The Acanto series ... timeless design and individually combinable. Elaborating on Geberit’s business ethos, he says: “We do not only supply products; we are business partners and we provide solutions. We have a wide range of good quality products, but what is most important is the advice we give to our partners, the timely and reliable service and after-service we offer including maintenance, spare parts availability and a 25-year guarantee on certain spare parts. Innovation is another key focus area as Nassar believes that any company that “does not work on innovation does not have a future”. Geberit also ensures that the products it launches in the region are chosen based on their suitability for this part of the world. “Water saving is very high on our priorities, and we focus on meeting and exceeding the water conservation norms of the region,” he says. “Geberit is one of the most sustainability-focused companies, ensuring that everything is sustainably sourced, sustainably used and sustainably broken down,” adds Nassar. Headquartered in Rapperswil-Jona, Switzerland, Geberit has strategic partners including the top players in each of the markets, to serve the requirements of projects in the region. Geberit solutions have been provided for several prestigious projects in the region including airports, hotels and shopping malls. Among the projects that it has recently supplied are the Saudi Electric Company headquarters in Riyadh and the Sofitel Jabal Omar in Makkah, both in Saudi Arabia; and Five Palm Jumeirah, Jumeirah Al Naseem, the Louvre Abu Dhabi, Mandarin Hotel Jumeirah, Bulgari hotel, Ajman Corniche residences and a super yacht for Gulf Craft, all in the UAE. Room dividers ... total solutions from Geberit. 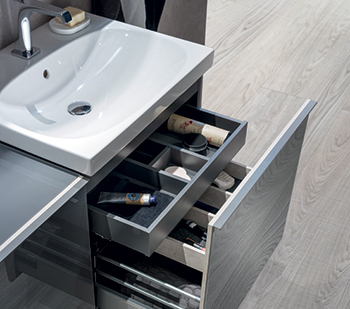 Within its ceramics line, Geberit is set to launch the Acanto bathroom series in the Gulf this month (April). 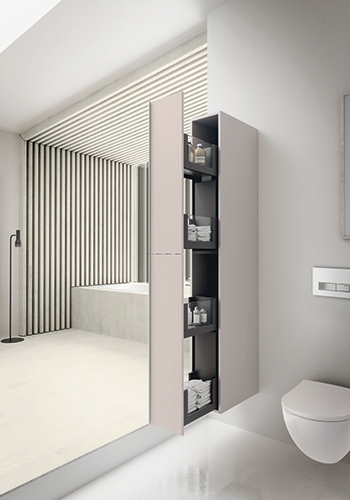 The Acanto series offers everything that is desired of bathrooms nowadays in terms of solutions, says Nassar. “The furniture and ceramic sanitary appliances have a timeless design and are individually combinable, and these include a wide range of washbasins, Rimfree toilets, bidets and bathtubs. The ceramic sanitary appliances impress, thanks to their soft organic shapes in combination with straight lines,” he explains. With the Acanto bathroom series, Geberit is focusing on the mid segment of the market for private and semi-public areas. The series includes standard washbasins with various projections, both with or without a shelf surface, as well as pure vanity basins with a SlimRim design. Acanto comprises both wall-hung and floor-standing WCs (water closets) – all of which are rimfree. 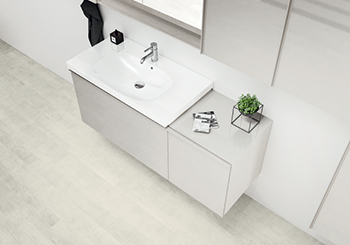 The furniture from the Acanto bathroom series can either be used as a stand-alone solution for the washbasin area (with washbasin, washbasin cabinet and mirror cabinet) or as a concept solution, where customers can combine the individual furniture types according to their needs and the space on offer. Geberit also offers 84 new products in its Variform washbasin range that fits any setting in the public, semi-public and private domains. Available in a variety of different sizes and shapes, the extensive modular system features under-countertop, countertop and lay-on washbasins, thus ensuring complete design freedom. It comes in four important basic geometric shapes – circular, rectangular, oval and elliptic. The washbasins are timelessly beautiful thanks to their particularly slim rims, says Nassar. The countertop and lay-on washbasins are offered with or without a tap hole bench. This means the tap can be attached to the ceramic appliance or the under-countertop plate as a deck-mounted tap or to the prewall installation as a wall-mounted tap, depending on the requirements, desired design and construction situation. Other innovations include its Sigma21, a dual flush actuator plate with a round design. The actuator has a frameless design and comprises high-quality materials with surfaces made of glass or slate available in four colour variants and is customisable. In terms of supply piping, Geberit has introduced many new pressing tools and jaws. “You may not see it, but every year Geberit ploughs back some 2.4 per cent of its revenue into research and development (R&D) – alongside our new product launches, a lot goes on behind the scenes. Our Future Technologies department researches, evaluates and develops new materials, surface technologies and procedures,” Nassar says.